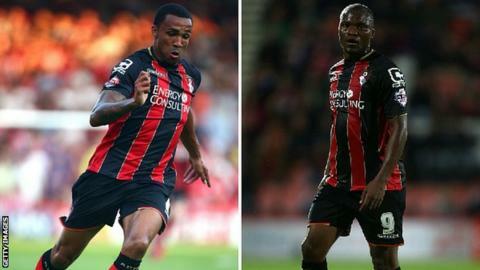 Bournemouth manager Eddie Howe says the Championship club have received positive news over injuries to strike duo Callum Wilson and Tokelo Rantie. Top-scorer Wilson, 22, has a slight strain to his hamstring and will face a late fitness test this weekend. Rantie, 24, has a partial dislocation of his shoulder and the South Africa forward could make the 2015 Africa Cup of Nations tournament on 17 January. "It's as good as we could have hoped for," Howe told BBC Radio Solent. Rantie, who has two league goals this season, was hurt after coming on as a substitute for Wilson during Saturday's 2-2 draw with Ipswich, but Howe is confident it is not a long-term injury. "Hopefully Tokelo's injury is not as serious as first thought," said Howe. "It's a partial dislocation which is good news. All I will say as a word of caution on that is that you never know until the player comes back how well the joint has healed. He is not totally out of the woods but it looks like good news at the moment." When asked if Rantie would make the Africa Cup of Nations tournament for South Africa, Howe added: "I can imagine it's a concern for them, it's not so much to me. Our own focus is to get Tokelo back as quickly as possible for us." Wilson has 11 goals since his summer move from Coventry and also earned a call-up to England's Under-21 squad. "We had a scan and it showed a slight strain to his hamstring and I'm talking minute," said Howe. "So we are hopeful he will be back for Saturday and we can get him fit. He has done some running, he is yet to do sprinting so we will wait and see how that unravels."